The obvious one: the U.S. leads in terms of protectionism. Which is ironic, given the U.S. championship of open trade agreements (TTIP and TPP being the most current ones) and the U.S. tendency to de-alienate the world into 'Free Trade' and 'Protectionist' groups of countries. BRIC come second and Europe comes third. Which is again highly ironic as BRIC rely heavily on trade-driven model for growth and Europe can't get over how (allegedly) free trade it is. Everywhere, save Russia and the U.S., state aid & bailouts is minor segment of trade protectionism policies. Export subsidies are meaningful in China and India. 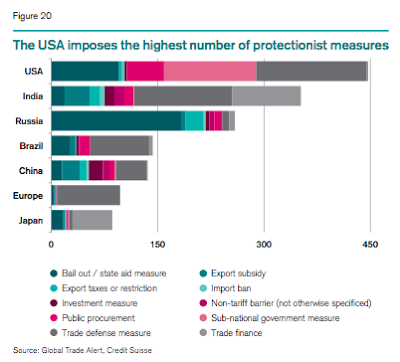 Trade defence and finance measures dominate in the U.S., India, Brazil and Europe, and are weaker in Japan and China, while virtually non-existent in Russia. All-in - a pretty ugly picture of reality post-crisis.